The Akiles FlexiCloser Automatic Wire Closer with Smart-Detect is the world’s first. The Smart-detect feature automatically detects and closes any size wire with just a push of the button. The Akiles FlexiCloser features a built in wire holder that makes loading books onto wire easy, especially when binding larger books. The wire closing range is designed to close all types of wires, from anywhere 3/16″ to 1 1/2″, in either 3:1 or 2:1 pitch. The micro adjust control panel also allows you to fine tune the closure for virtually any size wire and the magnetic back aligns and holds the wire securely in place during the closing process. If you have any questions or are interested in purchasing the Akiles FlexiCloser Automatic Wire Closer, visit us at SpiralBinding.com. 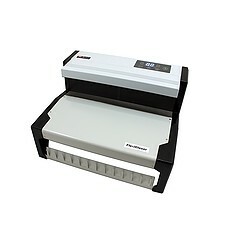 We have great pricing on a full line of Wire Closers. Call us at 1-800-631-3572 for more information!